Many animals are displaced due to legislation, leaving the animals with few options. We offer life time homes to these beautiful creatures. To educate young and old on the importance of conservation and preservation of all native and exotic species. Home to many endangered and exotic species, located in Live Oak Florida a non profit 501(c)3. Although we are not open to the general public, we do give private tours by appointment. There is no fee associated with this. We support the facility through donations of both monetary and items that can be sold at the yard sale. 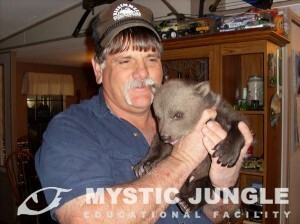 Mystic Jungle Educational Facility, is a non profit facility incorporated in 2010. On board we have many people from various walks of life from a veterinary technician, school teachers, humanitarians, retired law officials, and veterinarians. The founders have been in the animal field since childhood so not only with the school learning, they have the school of hard knocks, called common sense in the field of animals. We focus on the education of the general populace regarding the plight of our wildlife. We target the endangered and threatened species, but many other species call our place home. Our large cats, are DNA’d and Microchipped to further enhance their chances of being implemented in the SSP (Species Survival Program). We also take in animals that are needing new homes through no fault of their own. We do it through public donation, sponsorship’s and grants. Mystic Jungle can only continue on this life mission through these avenues. Barrel racer making to the NBHA national finals 3 years in a row. President in the Potowattomie County Humane Society, Shawnee Oklahoma 1983. Veterinary Technician and in the veterinary medical field for over thirty seven years, starting by volunteering in Ft. Lauderdale at Three Oaks Animal Hospital for OJT at the tender age of 13 years. Life time of land mitigation to aide in the recovery of ecologically threatened areas. 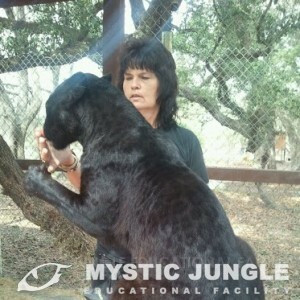 Life time of living and working with all species of animals, domestic and exotic. Life time of ranching and working cattle. Where The Wild Things WERE?